Correct posture improves efficiency and reduces soreness. While spinning on a stationary bike often takes the top spot at the gym, there's a lot to be said for hitting the pavement on a road bike, a term that simply refers to bikes meant to travel on paved surfaces. Cycling serves as an easily accessible aerobic exercise that provides a thorough lower-body workout, improves cardiovascular health, burns plenty of calories and even reduces stress. 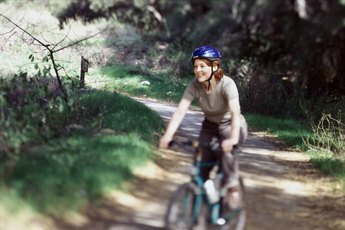 To get the most out of biking and prevent neck and upper-back pain, you must practice proper posture. When seated on the bike's saddle, your back should rest at about a 45-degree angle for the optimum production of pedaling force. Sitting with your back at 60 to 90 degrees may reduce back stress, but will make it more difficult for your lower body to produce force. For either posture, keep your head tilted slightly forward -- avoid keeping your neck in an forced upward position for an extended period of time, as this exerts a negative effect on your circulation. As you pedal on your road bike, keep your knee positioned over your forefoot. At the top of the pedaling motion, you should be able to draw a straight line from your kneecap to the ball of your foot, with your shins angled slightly forward. This leg position helps your body generate power. Keep your hips gently sloped forward rather than pulled in toward your chest. Think of hands playing a piano as you grasp the handlebars – if you feel like you could play the keys comfortably, you've found a suitable hand position. A comfortable, efficient and safe road bike posture allows you to absorb shock and prevents you from having to over-extend any part of your body to hit the brakes. To improve your road bike posture, chiropractic doctor Ron Fritzke recommends doing dynamic back, neck and shoulder stretches before riding and incorporating elbow presses and reverse shoulder shrugs into your upper-body exercise regimen. You might hear experienced riders throw around the term “fit” in regard to how a bike's frame accommodates the body of the rider. Properly fitting your bike goes a long way in correcting your posture. When straddling the bike, you should have about an inch of clearance between your body and the top tube, on a traditional straight-tubed road bike. 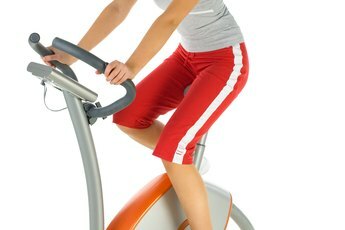 Pedals should accommodate a slight bend in the knee, about 80 to 90 percent of your full leg extension.